NOTE: Everything involved in this post is available for download here. I while back, I made this PCB that acts as a big daisy-chainable two-digit 7-segment display using the WS2803D and discrete LEDs. 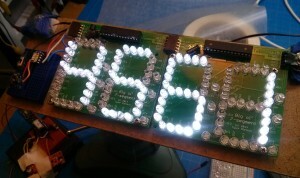 The pic to the right is a shot of the first use of these PCBs: a big sign that says “4561”. It works great, interfaces easily with AVR/Arduinos, and is cheap to build. Look at all those random patterns of light…it’s shameful. In a new layer in your EAGLE board layout, draw the stuff you want to 3D print. Do a series of conversions to get that EAGLE layer turned into an OpenSCAD script and then a STL for printing. Print, jam on board, enjoy a better looking display. 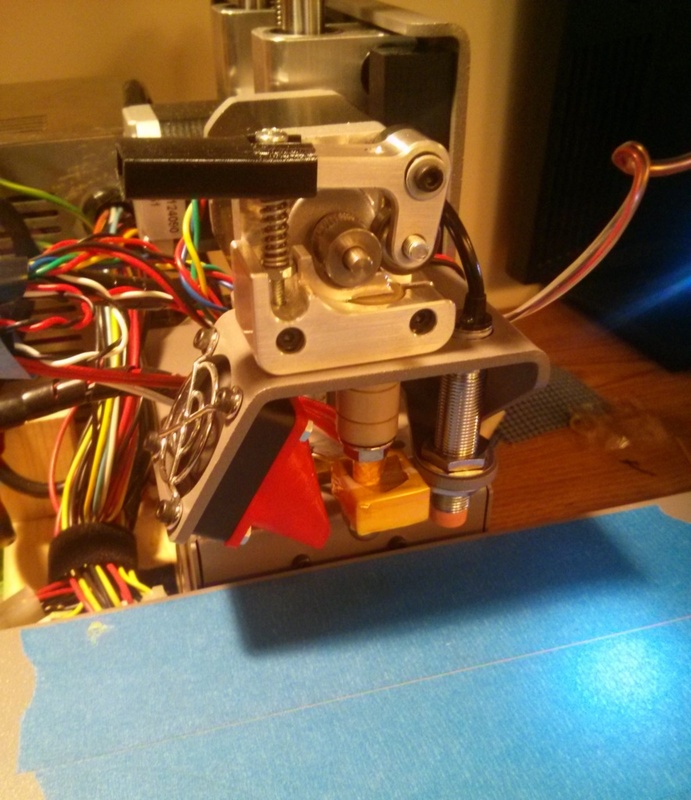 I really like my PrintrBot. It’s compact, reliable, and straightforward to build. Unfortunately, when I started getting ambitious with experimentation, I got into trouble. Basically, I started experimenting with things. First, it was printing with Nylon trimmer line. I was too impatient to dry the line as instructed, so it clogged everything up like crazy. That left me without a nozzle until I could figure out a way to clean it, and while I eventually did, it led me to wanting backup nozzles. 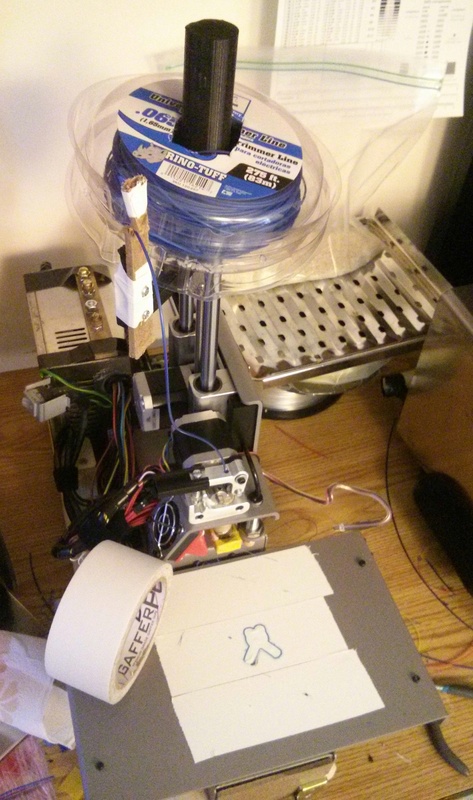 That’s when I started to discover how odd-ball the PrintrBot is compared with most 3D printers. It doesn’t take the nozzles that 95% of other printers do…instead of an M6-threaded male nozzle, it takes an U.S. 1/4″-20 female nozzle (see here for a comparison). This made me look into fabricating my own nozzles, because there aren’t third-party ones out there, and hell if I’m going to pay PrintrBot $8 a pop plus shipping for a bit of machined brass. 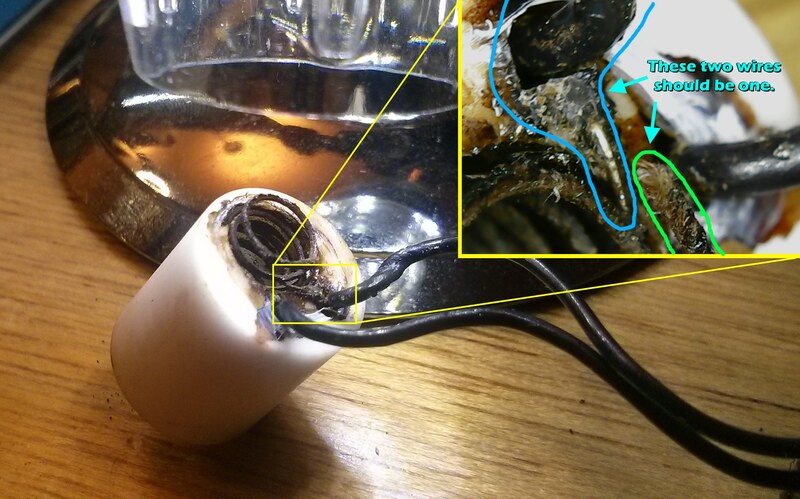 So it looked like I’d need a new heating element. 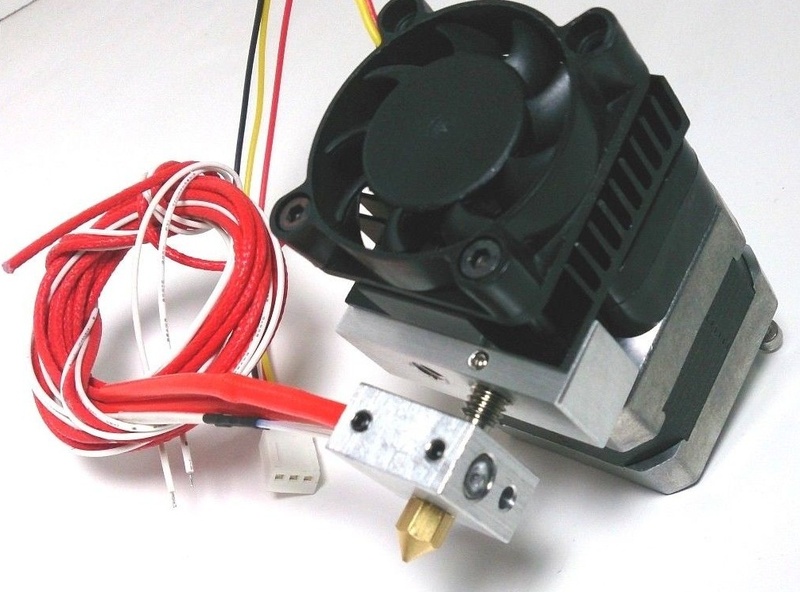 Unfortunately, this is another area where PrintrBot is very far from standard — nobody else uses this kind of heating element, and the PrintrBot store wants $59 for a replacement. 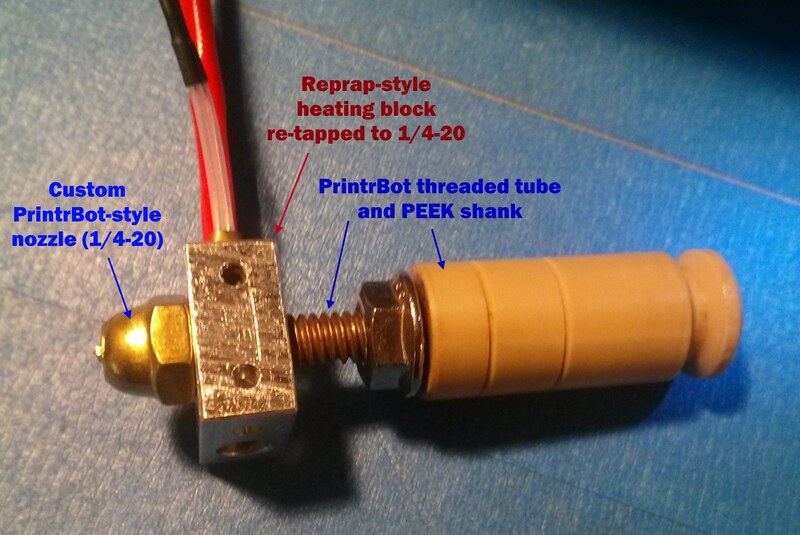 Meanwhile, the standard (as defined by cheap imports from China) is a small aluminum block with a heater cartridge and thermistor mounted inside of it (see right) that costs next to nothing. These hot ends are fully metric, with M6 threading for both the nozzle and shaft. I happened to have one of these, so I had an Apollo-13-air-scrubber style problem: how do I get the Reprap-style M6-threaded heating element to graft onto the U.S. sized PrintrBot nozzle assembly? To keep it tight, I used teflon table on the nozzle, and tightened the heating block against the nozzle itself. This has a bonus effect of heating the nozzle most effectively. 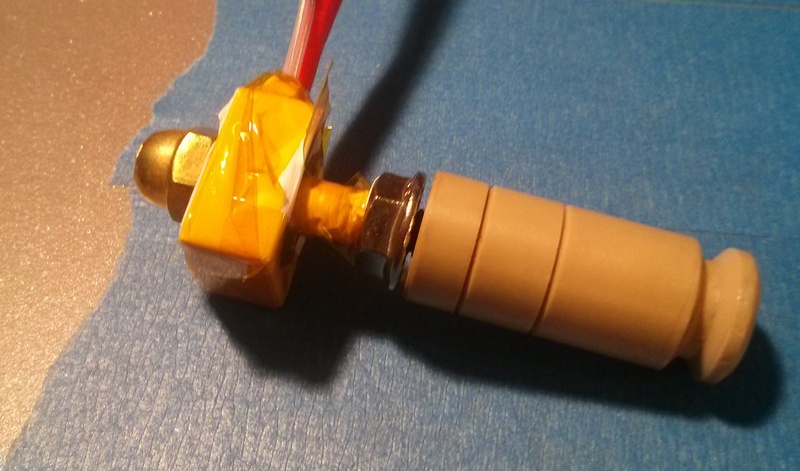 To hook up the connections, I just attached Dupont pins to the thermistor (female) and heater cartridge (male). The pins hook up fine, but I didn’t have the fancy PrintrBot-type connector housings. No matter – a bit of tape keeps them secured. With this done, I remounted it, recalibrated a bit, and was kicking off prints! Side note: I also found an easier way to fabricate nozzles than the link I provided earlier. I just got some brass cap nuts, as the original directions prescribe, but instead of building a makeshift lathe, I just started by drilling the hole, then “milled” away excess material from around the outside of the hole freehanding with a dremel cutting disc. Knocked out a 0.5mm nozzle in about 5 minutes.